Employee involvement is creating an environment in which people have an impact on decisions and actions that affect their jobs. Employee involvement is not the goal nor is it a tool, as it is practiced in many organizations. Rather, it is a management and leadership philosophy about how people are most enabled to contribute to continuous improvement and the ongoing success of their work organization. 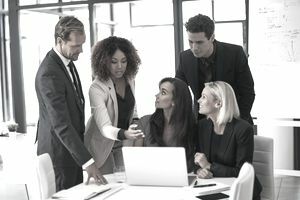 The bias of many HR and management professionals with many years of experience is to involve people as much as possible in all aspects of work decisions and planning. This involvement increases ownership and commitment, retains your best employees, and fosters an environment in which people choose to be motivated and contributing. You cannot place enough importance on the difference between an employee owning a goal, project, or team and an employee who was sweet-talked into the position. Employees who are sold on a goal or required to participate don't bring the same level of energy and enthusiasm to their job as the employee who owns the job. They don't bring the kind of discretionary energy you need for the most successful organization you'd like to create for your customers, clients, and employees. Employee involvement and engagement are also important for team building. Despite the need for the thorough involvement of all employees affected by a decision in decision making, consensus decision making which is time-consuming and may generate solutions that satisfy the lowest common denominator on which people can agree is not encouraged. How to involve employees in decision making and continuous improvement activities is the strategic aspect of involvement and can include such methods as suggestion systems, manufacturing cells, work teams, product teams, department meetings, continuous improvement meetings, Kaizen (continuous improvement) events, corrective action processes and periodic discussions of courses of action with the manager. For people and organizations that desire a model to apply, the best model of involvement was developed from work by Tannenbaum and Schmidt (1958) and Sadler (1970). Tell: The supervisor makes the decision and announces it to the staff. The supervisor provides complete direction. Tell is useful when communicating about safety issues, government regulations and for decisions that neither require nor ask for employee input. Sell: The supervisor makes the decision and then attempts to gain commitment from staff by selling the positive aspects of the decision. Sell is useful when employee commitment is needed, but the decision is not open to employee influence. Consult: The supervisor invites input into a decision while retaining authority to make the final decision herself. The key to a successful consultation is to inform employees, on the front end of the discussion, that their input is needed, but that the supervisor is retaining the authority to make the final decision. It is the level of involvement that can create employee dissatisfaction most readily when this is not clear to the people providing input. Join: The supervisor invites employees to make the decision with the supervisor. The supervisor considers his voice equal to theirs in the decision process. The key to a successful join is when the supervisor truly builds consensus around a decision and is willing to keep her influence equal to that of the others providing input. Delegate: The supervisor turns the decision over to another party. The key to successful delegation is to always build a feedback loop and a timeline into the process. The supervisor must also share any "preconceived picture" he has of the anticipated outcome of the process. the degree to which they understand how their job is connected to other processes within the organization. You can effectively involve employees in decision-making about their jobs. These degrees of involvement tell you how to most effectively pursue this goal. Reference: Tannenbaum, R., and Schmidt, W. "How to Choose a Leadership Pattern." Harvard Business Review, 1958, 36, 95-101. This article is an excerpt from the "Michigan State University M.E.N.T.O.R.S. Manual: Monthly Conversation Guide #9." Copyright Susan M. Heathfield and Michigan State University, 2003-2004.